UPDATE: The project will be completed by August and operating fully by November. Where those that live near by put themselves and their loves ones at risk. We had the privilege of being mentioned by Global Voices online with some more information on the issues these turbines present. In the Novel, Don Quijote by Miguel Cervantes the main character Don Quijote decides to fight against windmills thinking they were giants. Meters away from my home, there are 4 Wind Turbines in the past week (of 44 that will be installed) that have been set up. Why write about the Giants? Don Quijote felt he needed to defend himself from giants. I need to protect my family from these giants that are being installed in a densely populated area. Not only are they feet away from homes but they are in fertile grounds used for agriculture. Many protests are directed towards the ecological impact it will have (also true). In my case I see the health risks that this can bring to nearby residents. As I saw these giants go up I realized how close they are to my home. So I started doing research on the impact they have on people living close to them. Normally these wind turbines are set in Rural areas. Even then it affects people living at a distance of up to one mile. This subject has many grey areas on how studies being conducted that are not taking into consideration those living close by wind turbines. In states like Massachusetts, after denying Wind Turbines posed health risks, they recently shifted into thinking of creating regulations related to noise from wind turbines. The state has recommended that a wind turbine to be shut down while it conducts further studies. My point is the high risk those that decide to live near the wind turbines are taking and goes beyond just losing agricultural farmlands. 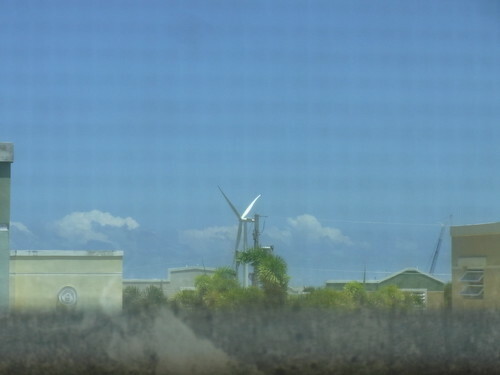 Once the wind farm in Santa Isabel starts operating, I plan to move elsewhere. As the first 4 of the 44 windmills are up, it’s a countdown to finish the project in November, Mayor Enrique Questell Alvarado celebrates how he puts us all at risk. Many of us should start planning to move elsewhere since this project seems to continue its reckless path by risking the well-being of the citizens of Santa Isabel. I have been in contact with a resident of Fairhaven, MA and they are having issues with only two turbines; imagine in a densely populated area with 44 Turbines operating. This person who has experienced the side effects of having a turbine near his home warms me of the risks these windmills pose. If you know anyone living near wind turbines please forward this post on to them. They might not be aware of the impact these turbines might have. It’s really terrible what they are doing in Santa Isabel. The main issue is that they are forgetting that they are KILLING the agriculture there. A town without agriculture will starve. Santa Isabel’s agricultural lands are considered to be of prime grade. It’s really sad what this government is doing. It’s like shooting one self in the foot. I’ll be translating this post and posting it on my page soon. Things to consider – Tell the mayor to move to site. Tell Department of Agriculture to provide their main purpose of the department which is to preserve and maintain agricultural lands for future generation.